Jean-Pierre LESUEUR (DarkCoderSc) releases another Browser Forensic tool for Community called "Orion Browser Dumper v1.0". 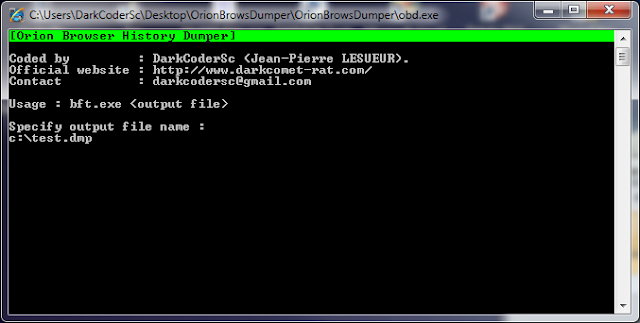 You can download the tool from Official Website of DarkCommet. Last week he also release "Browser Forensic Tool v2.0" - Its is also an advanced local browser history search engine, in less than few seconds it will extract the chosen keywords of most famous web browser, actually Internet Explorer, Google Chrome, Mozilla FireFox, RockMelt, Comodo Dragon and Opera.